Making a custom bed for your dog or cat is easier than you’d think. 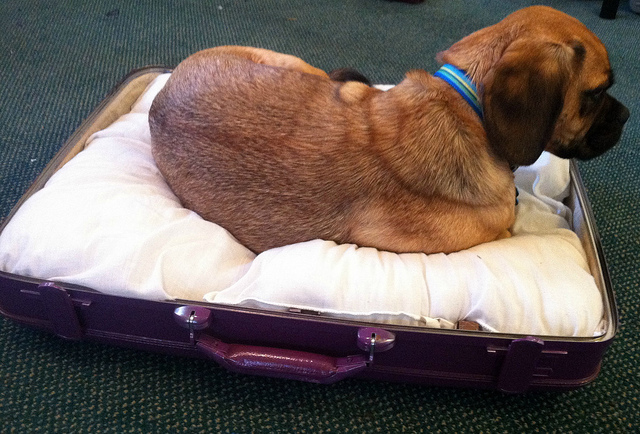 Check out these creative pet bed ideas for the comfiest of naptime havens. The do-it-yourself trend of creating clothing, gardening boxes, imitations of store-bought foods and a variety of tchotchkes out of items around the house isn’t going away soon, especially in the pet world. With a little handiwork and a lot of care, you can give your pet a soft, comfortable place to rest his adorable head using your own skill and cunning — and consequently, this yields a far more satisfying feeling for you than just purchasing a pre-made $50 bed. 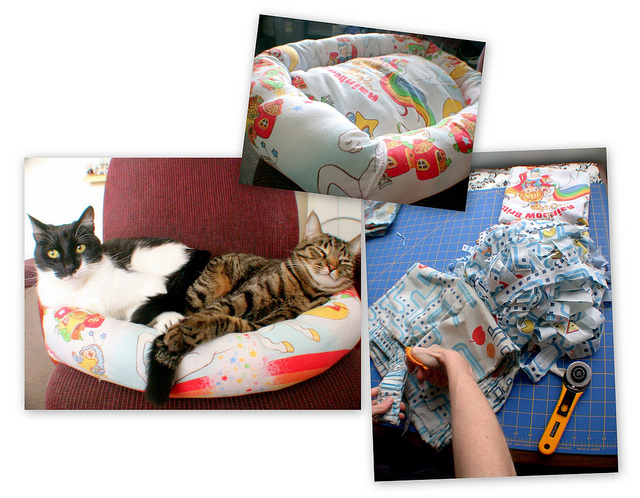 Here are some different ways to create a pet bed that will make you, your pet and your wallet very happy. Got an old office chair sitting around that you still haven’t donated yet? Instead of chucking it, turn that previous waste of space into a cozy nook for your pet by taking off the legs and reupholstering the cushions in easy-to-wash fabrics. The following project comes from this blog post; it gives terrific step-by-step instructions with pictures — and for a DIY-minded individual, it looks like a snap! Using a screwdriver, remove the metal legs from the chair. To make the chair stable and to protect your floor, add furniture pads to the bottom of the chair. Place larger pads at four corners and the four smaller ones (two on top of each other) toward the front to prevent the chair from tilting. Turn the chair back over and lay a blanket on top; start cutting the pieces to make the slipcover. Begin with the back and sides, leave the seat for later. Be sure to leave extra room when you cut — it’s easier to cut off the extra fabric later. Pin the pieces together and use embroidery thread to stitch the pieces together. Use a cross pattern to get a rustic look. Once the back is secure, cut a piece of the blanket for the seat. Pin and stitch it to the sides and back. Stitch two ties on the back to pull the back fabric together and make a bow. Tuck the bottom of the slipcover underneath the chair, if necessary; use hook-and-loop tape on the underside of the chair to hold the slipcover in place. If you aren’t into sewing a pet bed, watch this video to see how this pet owner devises a creative do-it-yourself pet bed free of sewing needles, thread and other pesky stitching accoutrements. If you own a sewing machine, you won’t want to miss this. Martha Stewart is the queen mother of DIY, and luckily, she’s whipped up one of her best recipes for pet owners: a cute, budget-friendly travel cushion that can easily be made into a fluffy bed by adding more towels and batting to the stack. Also, this is so easy to wash — just throw it in the machine. Cut 2 pieces of batting 1 inch shorter and 1 inch narrower than towels. Insert the 2 layers of batting into open end of towels, and sew up the last side. Stitch tufts in towels 6 to 8 inches apart: Using large sewing needle and a double strand of embroidery floss, stitch down through all layers and then back up about 1/8 inch from entry point. Trim floss, and tie ends. Repeat to make additional tufts. Another creative DIY pet bed idea: If you have the space and a love of all things vintage, consider taking the metal and wire guts out of a behemoth of an old TV and replacing it with soft, warm things, like cushions, pillows and blankets for your beloved cat or dog. Check out this blog to see in detail how one pet owner created a haven for her pup out of a bulky, antique TV. If the idea of hefting an old TV around doesn’t appeal to you, try using an old suitcase, trunk, dresser drawer, or wooden crate, making sure to cut and sand a little entrance for your pet to hop in and out of sheer comfort. If you don’t have the materials for these beds around your house, don’t distress! Check out the free section on your local Craigslist or thrift stores to find fabric and furniture for bargain prices. With a little extra scouting, you can find what you need for your pet to be comfortable and happy at home without your wallet taking the hit.